So it begins again! 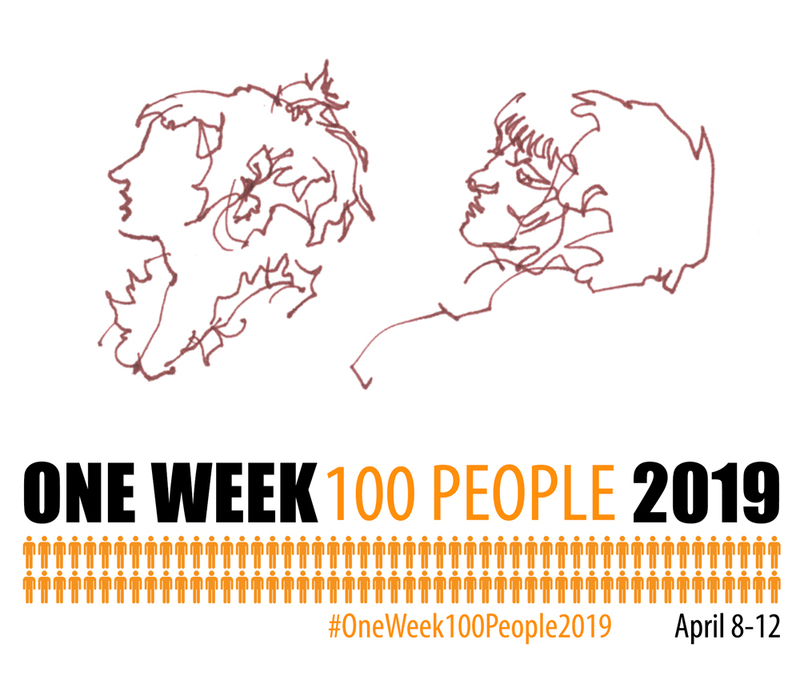 #OneWeek100People2019! All over the world, our little club of people are heading out sketching :) That’s pretty fun to think about. It’s nice to be part of something bigger than yourself. 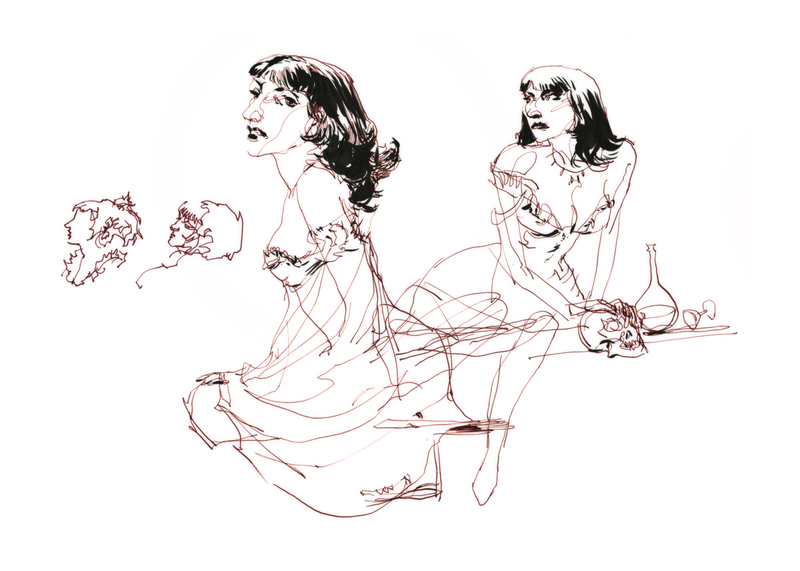 I wanted to post another set of life drawings. Just to give a few more examples of how easy it is to get to 100. I mean, it’s easy, if you let it be. If you let yourself ignore the idea of impressing people with great drawings, and embrace the idea of sketching only to learn. The beauty of rapid sketching is: it trains everything at once. Gesture: Capturing the posture, the emotion in a figure. Likeness: Making a portrait is a matter of seeing a person’s specific, unique variation from the generic human features. Even in these single line sketches above, you can see the sharp nose, narrow jaw, and over-hanging bangs, which define this model’s face. Proportion: We often want elegant, or at least realistic people – and yes, measuring works, it’s foolproof – but it’s kind of bogus. It takes too long. You’ll never successfully measure a person in the wild. 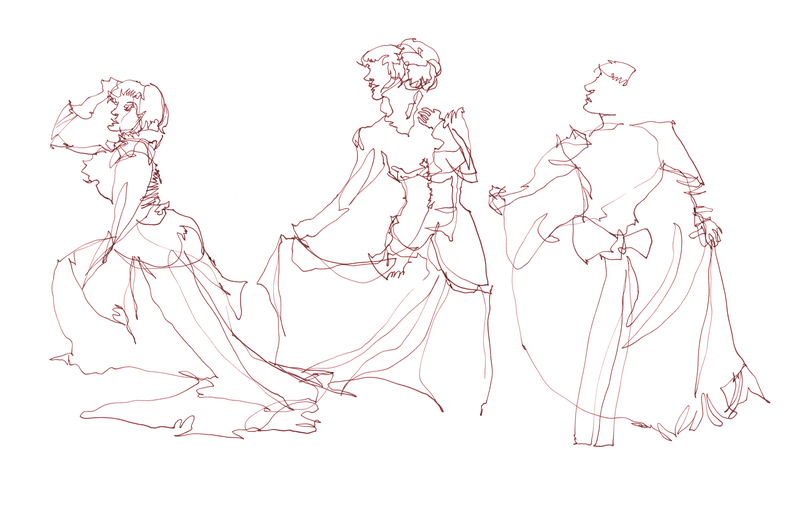 But you *can* learn to get accurate (or stylized) proportions in an instant. Simple repetition will give you this ability in only a year or so. 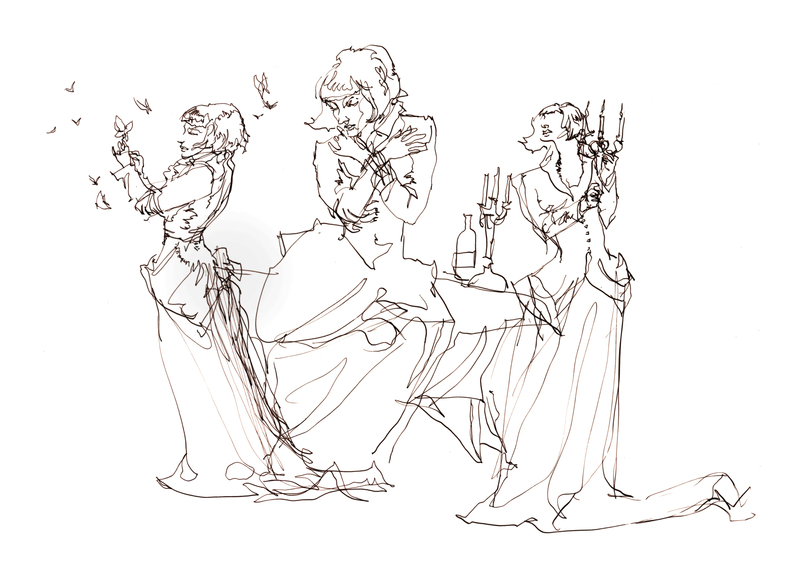 Gesture drawing can also teach you to paint! I always say, your smallest tool for line, your BIGGEST tool for tone. (In this case a Pentel brush pen). 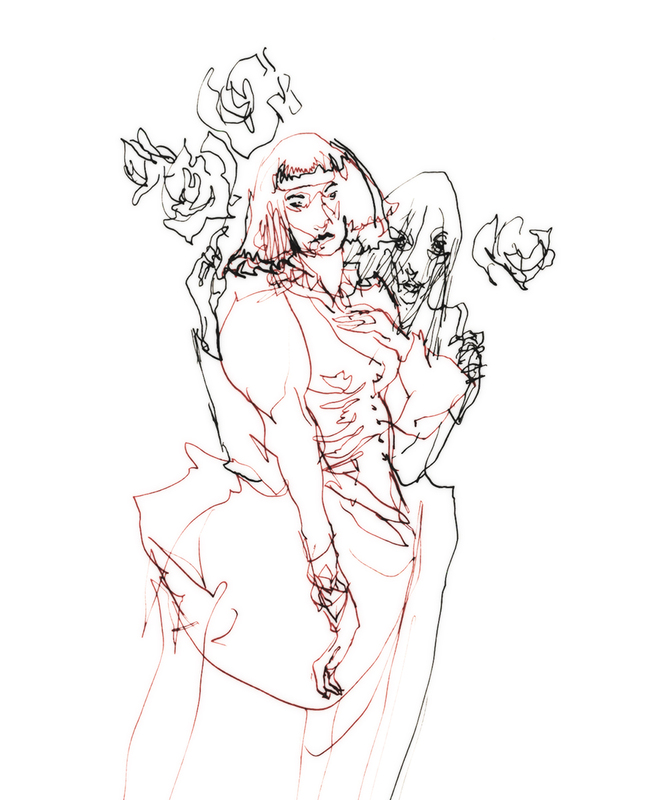 These kind of 2-5 min sketches are how you learn to see masses of shadow and volume. It’s not by painstaking rendering. It’s by learning to SEE the mass. And you do that by rapid repetition. Train your brain by doing it over and over, fairly quickly – much like you’re doing scales or chords on your instrument. 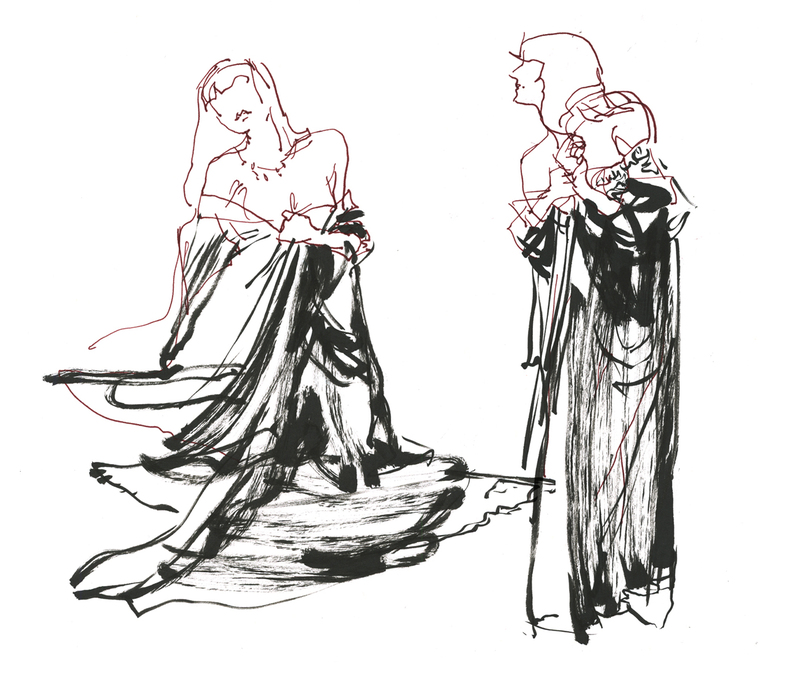 So when people say – “How do you draw people so full of life?” The answer is NOT that I take time to do a good job (even though these are 20 min poses), it’s that I’ve been practicing Gesture and Massing, and I can keep that life and rhythm when I slow down. Don’t let it stiffen up. Again – just like the musician – it’s not just the ability to play the notes – it’s to play with emotion. So, let’s dive into #OneWeek100People2019! Thank you so much for enlivening my art practice! I was trained in the 1980s in the commercial art scene by doing lots and lots of measuring, and I love the effect that gives me. However, having read your online instruction about one line sketching, and having actually done my first one line sketch today, I’m thrilled with the results. I’m a water-colourist and I also use fine waterproof pens by Stabilo, and I know I’m going to be producing some great sketches with this new method and enjoying it hugely. Good luck with your week of sketching 100 people and also with your legal issues. I hope all goes well.